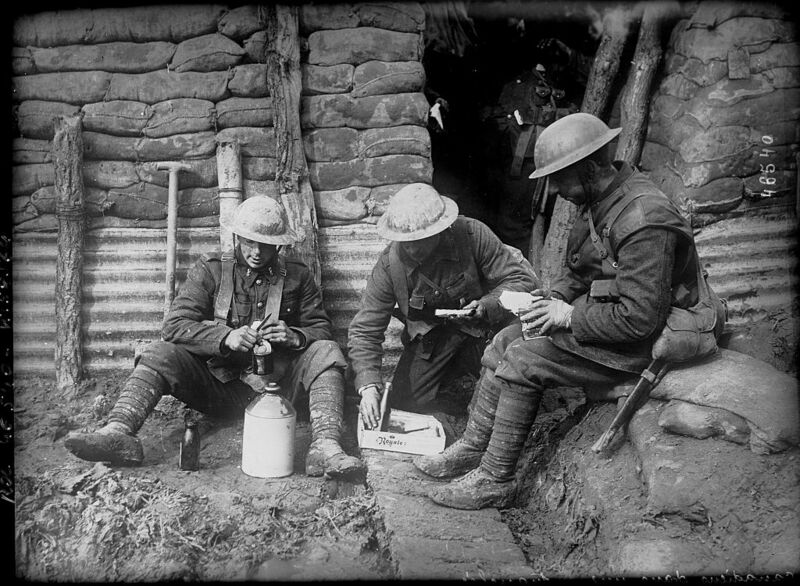 Canadian soldiers resting in a trench. The military history of Canada during World War I began on August 4, 1914, when Britain entered the First World War (1914–1918) by declaring war on Germany. The British declaration of war automatically brought Canada into the war, because of Canada's legal status as subservient to Britain. However, the Canadian government had the freedom to determine the country's level of involvement in the war. On August 5, 1914, the Governor General declared a war between Canada and Germany. The Militia was not mobilized and instead an independent Canadian Expeditionary Force was raised. Canada's sacrifices and contributions to the war changed its history and enabled it to become more independent, while opening a deep rift between the French and English speaking populations. For the first time in its history, Canadian forces fought as a distinct unit, first under a British commander and then under a Canadian-born commander. The highpoints of Canadian military achievement during the First World War came during the Somme, Vimy, and Passchendaele battles and what later became known as "Canada's Hundred Days". Canada's total casualties stood at the end of the war at 67,000 killed and 173,000 wounded, out of an expeditionary force of 620,000 people mobilized (39% of mobilized were casualties). Canadians of British descent—the majority—gave widespread support arguing that Canadians had a duty to fight on behalf of their Motherland. Indeed, Sir Wilfrid Laurier, although French-Canadian, spoke for the majority of English-Canadians when he proclaimed: "It is our duty to let Great Britain know and to let the friends and foes of Great Britain know that there is in Canada but one mind and one heart and that all Canadians are behind the Mother Country." Prime Minister Robert Borden offered assistance to Great Britain, which was quickly accepted.